Lose That Girl: RATE IT! 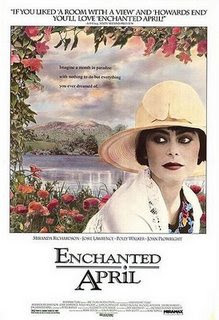 Enchanted April -- Available. FINALLY! Finally!!! The movie gem that we've been deprived of viewing on DVD is *finally* set for its disc release!! I was complaining about its absence from shop shelves just a few weeks back. 'Enchanted April' is available now on pre-order from Amazon.com! The film will be in shops on May 5! That date cannot arrive soon enough!